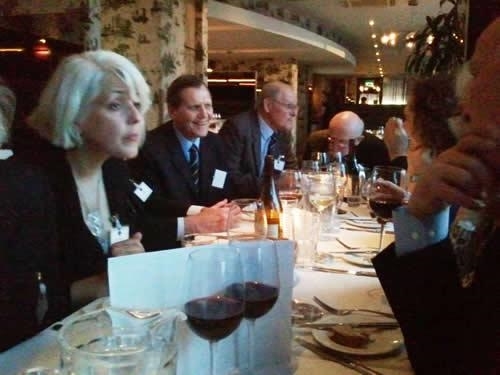 As a change from The East India Club, organiser Claire Morgan-Jones booked a table at a riverside restaurant called NORTHBANK. As the name suggests, the restaurant is ideally situated by the side of the Thames, just beneath and downriver from the Millennium Bridge with commanding views across to TATE Modern and The Globe Theatre. There were a total of 14 diners made up of 10 OHs, 2 wives, HCJS Head Tim Wheeler and Claire Morgan-Jones. Dining from the A La Carte menu provided a choice of four starters, followed by a selection of main course dishes, one of which consisted of Hereford Beef & Onion Casserole with Spring Leeks and Cornish New Potatoes. The evening started with Champagne at the bar before we all sat down to enjoy our meal at a carefully laid out table. Each place-setting contained a number of School DVD’s plus a copy of the Spring edition of ‘Blue & Gold’. This magazine is a quarterly journal that Head Paul Smith had reintroduced into the school in 2011, consisting of news about the various activities on campus. Towards the end of the evening Tim Wheeler, HCJS Headmaster took the opportunity to say a few words to all the guests present. An impromptu After Dinner Speaker? 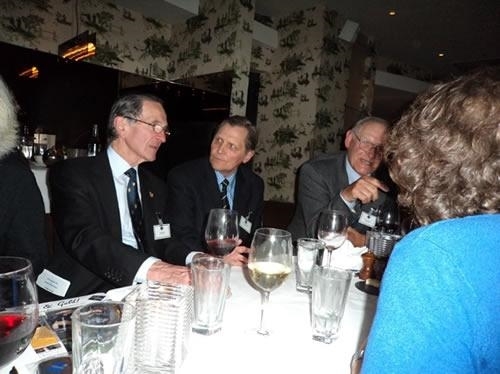 There were no toasts at this event but the ever present Michael Moreton (80) an indomitable, stalwart supporter of these London reunions, rose to start telling one of his well-worn jokes amongst the din and laughter.